No Land Grab: Brooklyn Lawyers Dodge "Manhattanization"
Meanwhile, Ms. Carponter and others on the committee hold out hope for victory before Justice Joan Madden in the Manhattan Supreme Court matter of DDDB v. ESDC, 104597, an Article 78 proceeding seeking to annul the Empire State Development Corporation's approval of the Atlantic Yard's environmental impact statement. 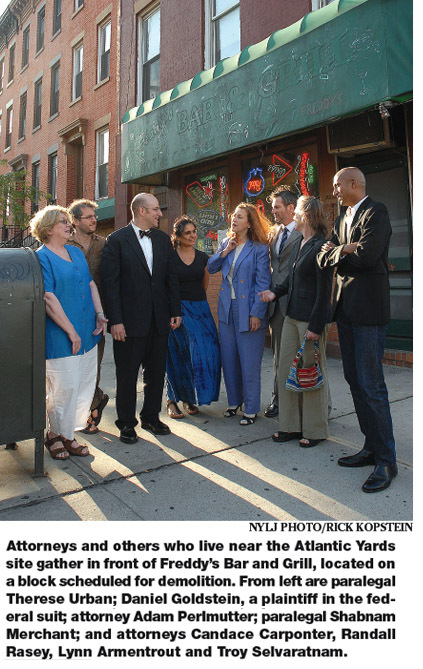 Funds for constitutional and environmental litigators hired at reduced rates by Develop-Don't Destroy were generated from bake sales and stoop sales, as well as walk-a-thon pledges and audience donations at screenings of an anti-Forest City Ratner documentary, "Brooklyn Matters." Matthew D. Brinckerhoff and Andrew G. Celli Jr. of Emery Celli Brinckherhoff represents the group in the federal matter; Jeffrey S. Baker of the Albany-based Young Sommer Ward Ritzenberg Baker & Moore in the state matter. Ms. Carponter said the legal committee "operates as our own law firm, basically, and what we're basically fighting is powerful government and rich folks run amok." Loren Riegelhaupt, a spokesman for Forest City Ratner, said the developer held "hundreds of meetings" with the community. As Atlantic Yards Report points out, "Nearly all of the meetings have been with allies, not potential opponents, and the Community Benefits Agreement coalition has defined "community" by invitation. Also, of course, the developer has famously shielded architect Frank Gehry from meeting with the community." DDDB is fortunate to have a dedicated, crackerjack, resident volunteer legal team acting as a backup law firm to our two retained stellar attorneys, Matthew Brinckerhoff on the federal eminent domain lawsuit and Jeffrey Baker on the legal challenge to the state's review and approval of "Atlantic Yards." Our committee of legal volunteers certainly helps reduce our legal fees, but the community's vast contributions to our legal fund is what will keep us going towards ultimate legal victory. We salute these selfless legal volunteers and all that they have given DDDB and the entire community concerned with and opposed to "Atlantic Yards." They have stood up for our democratic rights and constitutional rights, and continue to do so. If you see one of them, say thank you! With their dedicated volunteer work, our excellent retained attorneys, and your continued financial support of our legal fund, we will ultimately prevail.